It has been announced that from next year the square root formula for calculating the cash due per point in the clinical areas is to be abandoned. In brief this meant that the cash per point rose as the square root of prevalence rather than linearly with it. The theory was that there would be an economy of scale enjoyed by practices. For more information on this use the search box above to search for square root. Over time thought has moved against this theory. In the following year the 5% cut off will go. Previously practices with less than five percent of the maximum prevalence would be treated as if they had exactly five percent of the maximum. This could create some bizarre results. I have been asked by many people over the past couple of weeks what the effect on practices would be. Well after having a short holiday I have looked at modeling these changes based on last year's data. Before I discuss the results a couple of warnings about all that is to follow. It is a model, not a prediction. It is based on applying next year's rules to last year's data. It assumes that all of the indicators will remain the same - which is simply not true. It assumes that practice behaviour is identical which is unlikely. I have also had to make estimates at the prevalences of smoking and depression screening which were not published for England this year. These are likely to be close but not exact. I am not using the Dep 2 indicator at all. This is a model and not a detailed estimate - but it should be close. So on with some meat. The figures for each practice are available from the left hand menu of each practices page. These are expressed in terms of the equivalence number of points gained and lost. To get the overall picture you can see the spread of practices in the graph above (I have taken eight outlier practices off the top to make the rest of the histogram clear - they tend to be unusual practices and so have unusual patterns of prevalence). We can also look at practices in groups. Perhaps the most obvious group to look at are University practices. Dealing with younger people they tend to have a lesser incidence of chronic disease - particular cardiovascular and pulmonary diseases which dominate QOF. A rather crude search shows 26 practices in the database with the string "Univ" in their address. 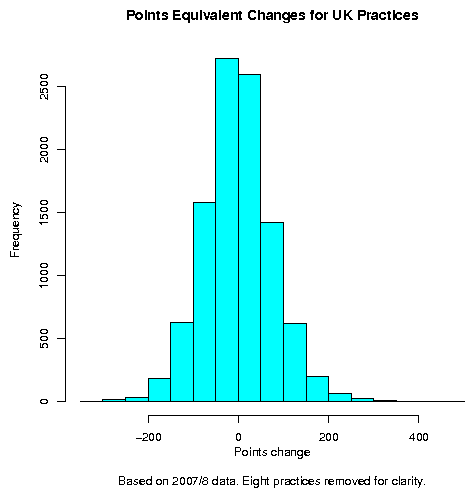 On average these practices lose 234 points equivalent from their QOF payments. These were the practices that started from a very low base so to lose this amount is very significant. In fact after these changes their take home points from the entire clinical domain is an average of 93. 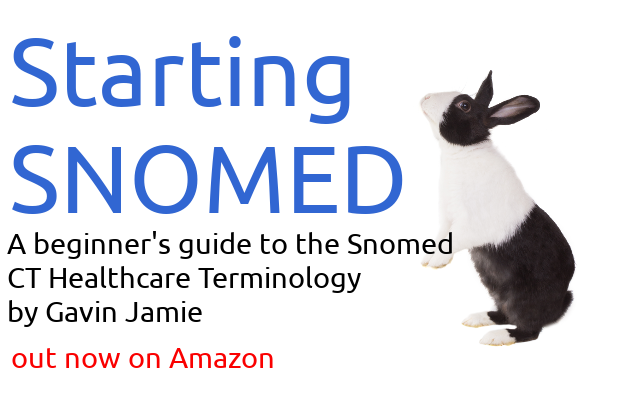 Their clinical domain is less valuable to them than the patient experience domain. This is likely to have a very significant effect on these practices. We can also look at the effect at PCT or Health Board level. You can see the PCT level changes online or download a (7k) csv file. The winners and losers are quite dramatic. London is hit hard with both Lambeth and Westminster losing the equivalent of over 100 "full price" points per practice. The clear winners are in the North of England or attractive seaside resorts or, in a couple of cases, both. Two PCTs gain over 100 points per practice. County Durham PCT is going to have to find another one and a half million pounds per year to cover the cost of these changes. Meanwhile in Lambeth eight hundred thousand will be taken from primary care. Of course both of these could be told, more optimistically, the other way around! The message here is that although this change may be cash neutral at the national level the same is not true at the PCT level. As the graph above shows we have a normal distribution. These changes will be moderate for most, large for some and extreme for a few - a couple of practice gain over a thousand points although they are not large but small and specialist practices.